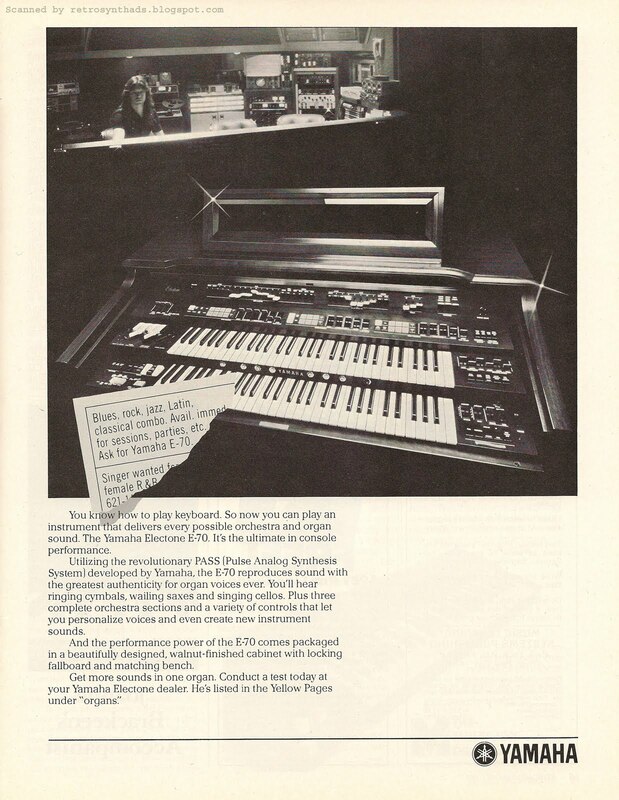 Yamaha E-70 organ advertisement #3, from page 41 in Contemporary Keyboard October 1981. This final Yamaha E-70 ad appeared in CK with a clear purpose. It began running regularly through out the holiday months starting in October 1981, for five consecutive months. People are just more in the buying mood during the holidays, I guess. But, Yamaha just had to do things a bit different. So, for the first, third and fifth months, the ad appeared in colour, while during the second and fourth months, it appeared in black and white. 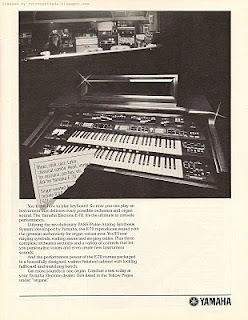 Like past E-70 ads, this one mentions Yamaha's "revolutionary" PASS, aka Pulse Analog Synthesis System. It also highlights many of the orchestra preset sounds that are available on the E-70. But, unlike previous ads, this ad really starts moving the E-70 into more "un-organ" territory. Here's what I mean. In all past E-series ads, including those for just the E-70, the first sentence of the ad-copy has ALWAYS mentioned the E-70 in terms of being an organ. "Yamaha's new Electone console organs deliver a variety of uncompromisingly-real, precisely-defined sounds." "It's an organ! It's an orchestra!That's what you get with features like the Upper Orchestra section on the fabulous E-70 and E-50 Electone Organs. " 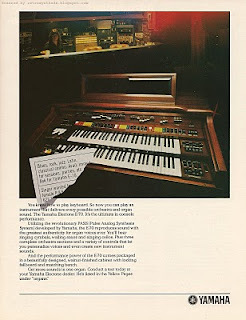 "Now that you've finally learned to play an organ, you owe it to yourself to play up to a Yamaha Electone E-70. " You know how to play keyboard. So now you can play an instrument that delivers every possible orchestra and organ sound. And, in the photo, the pull out image of the newspaper personals/advert doesn't mention "organ" at all. It seems the marketing emphasis has switched from the E-70 being an organ that plays realistic sounds, to the E-70 being a keyboard that plays orchestra and organ sounds. It's subtle. But I think significant. My guess is that Yamaha realized that keyboard players were looking more closely at the E-70 as a blues, rock or jazz keyboard. Not an organ in a stuffy little living room (as pictured in the last ad). Luckily, Yamaha also built one of the monsters of the synth industry at the time - the CS-80. I would think keyboard players at the time would have been comparing the two. And probably mostly the presets, since the E-70 focuses closely on those. In my recent back-and-forth emails with FlameTopFred, he pointed out the fact that there were more preset buttons for each bank on the E-70 than on the CS-80. "The CS-80 has 11 preset buttons for each bank (x 2 channels). The E-70 has 18 preset buttons for upper and 12 preset buttons for the lower manual - but the lower manual sounds can be coupled and blended with the upper manual sounds. Plus the E-70 has an additional bank of 12 preset buttons of mono CS-80 type synth sounds - and some are very, very good bass sounds. Some of those can also be used for lead type sounds, but you would have to play on the lower keyboard." And then FlameTopFred said something that, frankly, made me look at organs in a totally new light. "The CS-80 is an amazing synthesizer. But the E-70 deserves a second look - especially by anyone that loves having a lot of very musical features in one box. Two 61-note manuals, arpeggiator, bass-line-arpeggiator, drum machine. I find it strangely odd that those big home organs of 1977 had everything working cohesively - which MIDI then exploded out into separate components. It takes ages of time and lots of patience to make unrelated MIDI components work as flawlessly as a big E-70 running on all cylinders." Organs did have a lot of tech working together - very cohesively. And MIDI must have affected organ evolution by allowing the components of organs to be sold separately. Suddenly you didn't need to buy one big piece of equipment. You could mix and match. But, other technology also kept evolving along with MIDI, which led to the evolution of large workstation keyboards. And those workstations really just brought back together all the different components of the organ together again (along with a sequencer).